IN a city where new eateries open and older ones close with the frequency of the waves lapping at the nearby seashore, Tel Aviv’s Levinsky Market stands as a place where people have anchored their food businesses for decades. 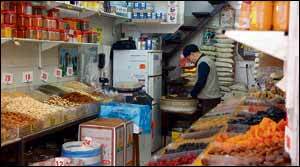 Occupying a seven-block stretch of Levinsky Street in the south of the city, the marketplace of dry goods, spices and delis founded in the 1930s by working-class Balkan Jews attracts shoppers looking for specialty items and the smoked and briny flavours of a bygone past. But it was, in fact, the market’s time-honoured quality that recently attracted a surprising newcomer to the scene: the upmarket vegetable-centric restaurant Opa. “I think that Levinsky Market is one of the last truly authentic places remaining in the city,” said Shirel Berger, chef and co-owner of Opa. Opa is the latest plant-based addition to the area, but certainly not the market’s first vegan establishment. Over the past few years, the number of Israeli vegans has swelled to five per cent of the city’s population of approximately 400,000, ranking it high among the countries with the largest number of vegans per capita. Tel Aviv alone boasts 400 vegan-friendly eateries, and several have found a home in Levinsky Market. “Levinsky Market was actually always a place for vegans without intending to be,” said Ori Shavit, a Tel Aviv-based food journalist and vegan advocate. “It has an abundance of pantry staples that are an inextricable part of vegan nutrition, especially anything related to the world of grains and beans, nuts, seeds, dried fruits and, of course, an enormous range of spices. Certain plant-based foods were always abundantly available through vendors in the market, such as the nationally beloved hummus and falafel. But Levinsky’s vegan menu has now grown to include items such as non-dairy malabi (a vegan version of the traditional Persian milk pudding topped with rosewater syrup and crushed pistachios), cashew-cheese pizza, borekas and non-dairy cheeses. There is even an all-vegan delicatessen resembling the style of Haim Rafael’s veteran establishment. The Taste for Life deli opened five years ago. Like many of its Levinsky Street neighbours, it makes all of its own spreads, producing pepper-corned pastrami made from walnuts, tart coconut-based yogurt and soy cheeses. “Today the vegan options around the market are very diverse,” said Shikma Jacoby, a vegan blogger and advocate who found only two plant-based eateries in the market when she moved to the area three years ago. These options include the veteran street vendor permanently parked in front of the Eliyahu Hanavi Synagogue with signs advertising the rare homemade vegan malabi; Café Kaymak, which serves plant-based versions of traditional home-cooked dishes; a tahini-based tapas restaurant with an entirely vegan menu section called Hatahinia; and an outdoor café, Tony ve Esther, offering elaborate vegan breakfasts that include almond-based labane cheese, tofu scrambles and vegan affogato (ice cream-topped espresso). Side streets off Levinsky house Lila Pizza, which happily substitutes cashew cheese on any of its pies, and an artisanal coffee roaster, Cafelix, serving vegan desserts. These eateries are certainly not the establishments that Levinsky Market was built upon, but they seem to easily coexist with the veterans. Opa sits midway on a block bordered by Fat Dog hot dogs on one corner and a cheese shop called Hahalban on the other. Berger has found ways to incorporate some of her neighbours into her kitchen. Asked how long he’s been selling coconut-based malabi from his street cart, the vendor outside the synagogue answered “for years already. Everybody likes it”.